Sunshine Through the Rain: Flying chickens! Another friend leaving, another gift needed as a token of thankfulness for a friendship that has been a sweet blessing. 'Sew Organised for the Busy Girl' by Heidi Staples has become my go-to book for gifts recently. This time I chose the Chevron Table-runner and pulled some fabric that I knew my friend would enjoy, as she had gifted it to me! This was my first time making flying geese and I was surprised by how well they turned out! I think just about all my points survived! I had an issue quilting with my navy 50wt Aurifil thread - it just didn't form great stitches as compared to my standard Aurifil 50wt 2600. Has anyone else had this issue before with different colours of Aurifil? For the back and binding I used a Lotta Jansdotter Glimma fabric which I have been hoarding for a while! It looks lovely; so sorry that a friend is moving away. I hope that this gift reminds them of you and your friendship. ooop! Not vertically, I mean horizontally ! It always sad when a friend moves away, I hope you can both stay in touch. Lovely runner and well done on those points!! I Especially love the colours, it reminds me of some china plates I have from family in the Netherlands :) I've had trouble with using coloured threads before (not specially always Aurifil). In my case I think it's because I can see quite specifically how the thread is sitting on the fabric in high contrast. Hi, so attractive ! How neat this would be on the Kitchen table ! Thanks for sharing ! Deborah , is it a large 1422 yards or small 220 yards spool of mine that did give you the issue ? can you be so kind tell me the navy color number ? This is a beautiful and useful gift Deborah. Those prints are delightful and work so well together. 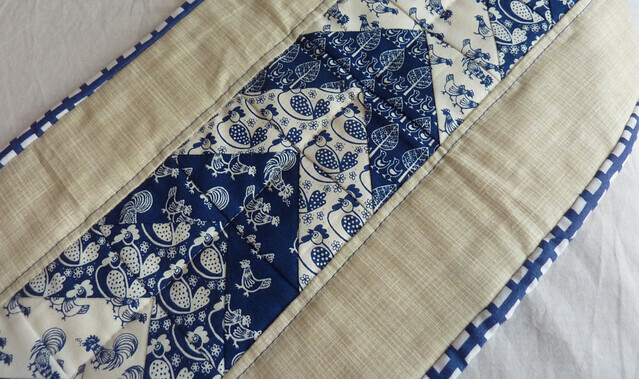 I'm pleased you enjoyed sewing flying geese too, so pretty in blue and white. 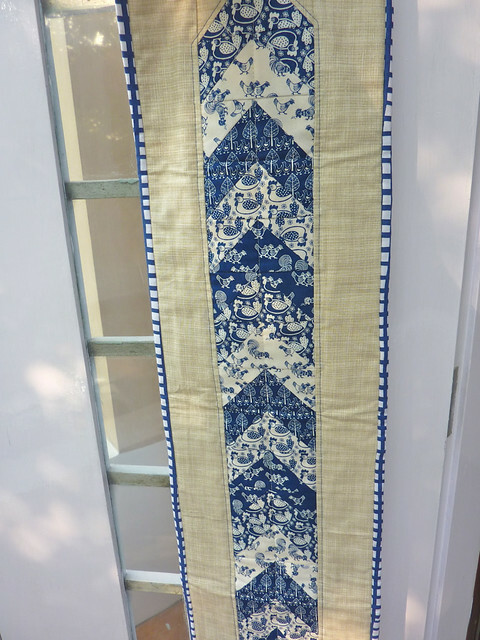 That is a beautiful table runner. I know I would be happy to receive and use it. Great fabric choices by you and your friend. You cannot go wrong with a classic blue. 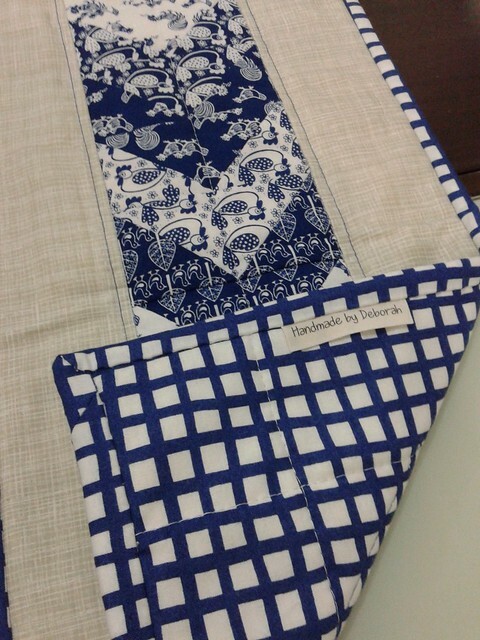 This table runner is sweet! 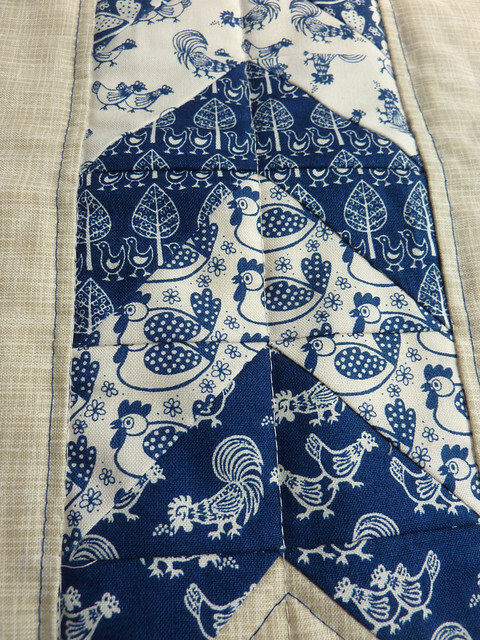 The navy combo is really pretty and who doesn't Love chicken fabric! The backing coordinates perfectly. I'm sure your friend loved it! 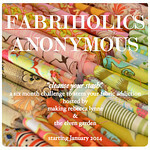 Ho, Ho, Ho and on We Sew, tutorial and giveaway!